This week has been a little bit insane, and it’s aiming to be only more so until November hits on Sunday, so bear with me these last few days of Vegan MoFo 2009. I tried…but, well, last year was a bit more successful on the daily posting side of things. Lately I’ve been making a lot of soup–it goes a long way, is cheap, filling, and absolutely satisfying with a slice or two of bread and a nice little salad on the side. The current soup is a mash-up of butternut squash, acorn squash, Indian spices, and coconut milk. It’s a little spicy and hearty, squashy and coconut milky all at the same time–a blend of flavors and textures that I really enjoy. If you have the time, straining the soup will help take out any little bumps and squash pieces in the soup, but I don’t mind them so I just whir it through the food processor and leave it at that. Saute the onion until translucent, approx. 5-7 minutes. Add the garlic and spices, cook for 1 minute until fragrant. Remove from heat. Scoop the roasted squash flesh into a food processor. Add the onion-garlic-spice mixture. Add the coconut milk and water and blend until smooth. Add more water as needed. Pour into a pot to reheat. Serve with bread & a salad or side of your choice. I bet this is the most warming, comforting soup ever! It looks so vibrant and rich, I can’t wait to give this recipe a try. Thank you for sharing. Simply perfect… I must go and get some squash to make this, asap! ok, can you please cook for me?? this is amazing. one of my favorite things to make and eat. don’t ‘cha just love how awesome soup is?! you’re so right, Jes – it’s yummy, inexpensive, filling, and pretty darn easy to make (and hooray for it going so well with bread!). i absolutely adore squash, but i’ve never made a soup with it before. i don’t know what i’ve been waiting for! i’ll be making your curried winter squash soup – as i love all things coconut milk & curry infused. mmmmm! Yum! I make a soup like this, too. No recipe needed, just squash, broth, curry and cumin, coconut milk, and a spoon! I love soup this time of year. It’s so warming and so easy! Squash soup and greens is what I like! 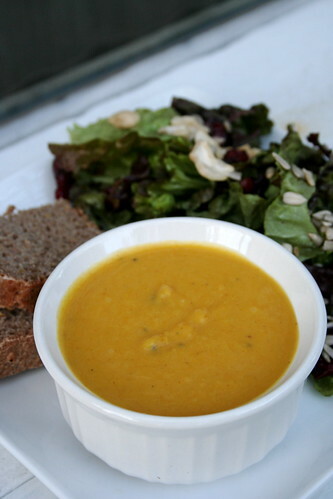 I also love how easy and delicious squash soups are, plus their creamy texture.